Washington, DC – On Friday January 6, more than 150 resorts across the U.S. and Canada came together for the second annual World’s Largest Lesson Day. It was a second attempt to break two Guinness Book of World Records for largest simultaneous ski and snowboard lessons, respectively. 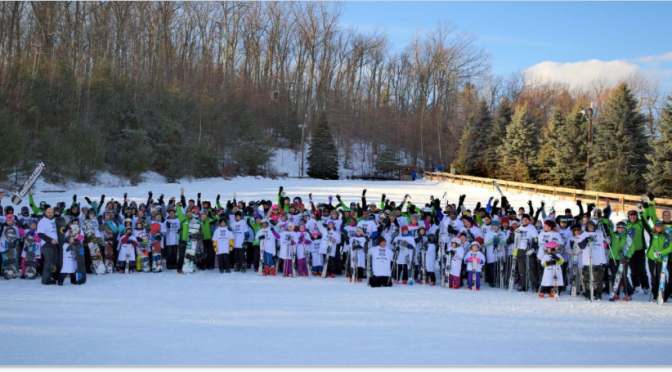 Wachusett Mountain Resort in Massachusetts reported the greatest number of participants with 168 total in attendance. New Jersey’s Mountain Creek Resort followed closely behind for the number two spot with 163 total participants, while Ski Butternut also in Massachusetts placed third with 130 participants. All of the participating resorts lesson numbers are currently being collected and prepared to be sent off to the verification team at Guinness World Records to confirm if either of the current records were indeed broken. Organizers feel confident they have enough verifiable information for the ski lesson record and are close on the snowboard record. Guinness makes the final decision. More than 80 U.S. resorts and 70-plus Canadian resorts collaborated to try and set a Guinness record for both the largest ski and the largest snowboard simultaneous lesson at multiple venues. Each resort’s lessons took place at exactly the same time across seven different time zones in the US and Canada. Each resort had to follow stringent Guinness World Record provided guidelines and documentation to ensure that their guest’s participation would count in the overall record numbers. Ski and snowboard resorts of all sizes participated, although not all had the required minimum number of participants in each discipline. Yawgoo Valley in Rhode Island is one that did have large numbers and did qualify. Video: First Tracks!! Online’s Martin Griff visits the world record attempt at Canaan Valley, W.V. Documentation is submitted separately for ski and snowboard disciplines. Guinness requires a minimum of 25 participants for each discipline in order for a resort to officially qualify. Several host sites qualified for both records, some qualified for one and some were not able to officially qualify for either but still could participate in the industry’s “informal record”, according to Mary Jo Tarallo, director of the industry’s Learn to Ski and Snowboard (Month)/Bring a Friend initiative. Event organizers will be packaging each resort’s documentation information together and submitting to Guinness shortly. Once in their hands it will be up the record verification team at Guinness to authenticate the record attempts and final numbers, a process that will take six to eight weeks. The World’s Largest Lesson served as the “unofficial kick-off” for LSS(M) which is taking place in the month of January across the United States. Throughout the month guests can find numerous promotional offers and incentives for taking a lesson and learning to ski or snowboard at more than 250 participating U.S. resorts.